Festacular Blogomatic: Someday Is NOT a Day of The Week: SUBMIT YOUR FILM IMMEDIATELY! 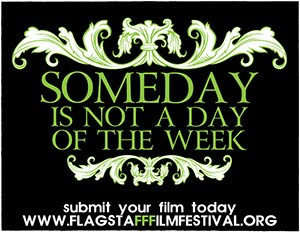 Someday Is NOT a Day of The Week: SUBMIT YOUR FILM IMMEDIATELY! Regular submissions end tomorrow at midnight, so please oh please be fiscally responsible, and submit your film immediately. Here's a break-down of this month's fee structure. For complete festival information and rules and officially type thinggies, visit our website.